And the walk is underway! Shoulsbury castle trig point. Highest point of the day on Exmoor (472 metres). Heavy showers but short & intermittent followed by bright sunlight. The ground saturated & heavy going. All 40 walkers have done amazingly well so far. (Meanwhile, the van team – who spent the morning swapping Oysterband instruments and gear out of the van and loading walking tour gear and PA – have arrived in Devon and are having the first debate of the tour about whether the jam or the cream goes on first. Practical tests inconclusive, further study required). 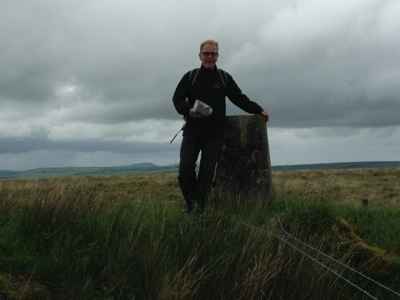 Brilliant walk despite the Exmoor weather – looking forward to Barnstaple tonight!